Dates of Learn to Row courses for Adults in 2019 have been published. Our first course starts on Sunday April 28th and will take place each Sunday thereafter for 8 weeks between 11.30am and 1.30pm. The course is for age 16+ beginners, and no experience of rowing is necessary. The cost is £95. To apply please read the pre-course information and return the registration form together with the course fee of £95 payable to ‘Durham ARC’. Envelopes should be addressed to Learn to Row, Durham ARC, City Boathouse, Green Lane, Durham DH1 3JU. There is also a course for Juniors (11 to 15) during the Easter holidays, taking place each day between Monday April 8th and Friday April 12th from 9.30 to 11.30am. The cost is £65 and the registration form is here. Please contact us by emailing explorerowing@durham-arc.org.uk for any further details about courses or to be added to the waiting list. 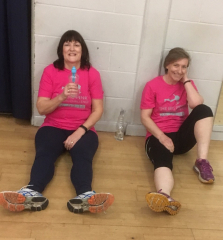 This entry was posted in Club News, Uncategorized on March 10, 2019 by Colin Lawson. It’s been a busy few weeks for squads as the Tideway season looms for some, while others concentrate on preparations for the coming regatta season in April. Conditions were good for Tyne Head of the River race on February 16th with 10 crews from DARC among the 150 entries joining crews from Lancaster, York and Glasgow, as well as local clubs and Durham University colleges, to contest two divisions over 5km from Scotswood to Newburn. George Adair’s Masters F 4x- ran out winners in their category and the senior men’s 8+ were second to York in band 3 of the open 8+. All the results can be found on the Tyne Head website. The following weekend saw the Juniors off to Nottingham for the Head of the Trent on Sunday February 24th. An excellent day it proved to be with good conditions after a misty start, and a 100% success rate for the DARC crews, the J15 girls 8+, J15 boys coxed quad and J14 girls coxed quad, racing over 3.8km in division 2, all winning their events, overcoming opposition from Nottingham, Bedford, Birmingham and Leicester, while Gill Prescott’s composite women’s Masters F coxless quad also won over 5.7km in division 3. Results and other information are on the Head of the Trent website. Next was the Yorkshire Head on Saturday March 2nd, organised by the Yorkshire Rowing Council, again with 10 crews from DARC entered amongst 175 in the two division time-trial over 5.1km of the River Ouse in York, this time with victories for the Masters F 8+, Andy Jaggard in Masters G 1x, Adam Morris in J18 1x and Gill Prescott in a women’s Masters F 4x- composite with Loch Lomond, Mortlake, Anglian & Alpha and Barnes Bridge Ladies RC. DARC’s senior men’s 8+ finished second to Leeds in band 2 of the open 8+. Full results can be found on the Yorkshire Rowing website. Trials for the Junior Inter Regional Regatta, postponed from February, also took place at Cambois on March 2nd and it proved to be a successful day for the DARC competitors. There were event wins for the J16 4x-, J16 8+ (DARC/Durham School composite), WJ16 4x-, J15 4x+, WJ14 4x+ and WJ14 2x, who go forward to be considered for selection for the squad to represent the Northern region at the Junior Inter Regional Regatta at Peterborough on April 27th, subject to satisfying rules relating to doubling up. Results of the trials are here. 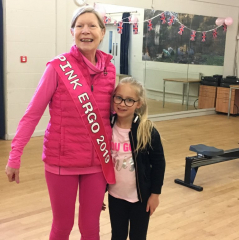 On Sunday March 3rd Roger Stainforth organized a group ranging in age from 7 to 74 to take part in The Big Pink Ergo 100km challenge, with 27 members of various squads raising funds for breast cancer charities. The first round of the Sunday League took place at Tyne ARC on the same day with the team from DARC getting off to a good start winning 3 races out of 4. Round 2 is a sweep-oar splash & dash event at Durham on April 7th, the same day as the University Boat Races. The first Tideway heads of the season take place next weekend with the Schools’ Head on Friday March 15th and the Women’s Eights Head of the River Race on Saturday March 16th. Good luck to the J15 girls eight and J16 boys quad in the Schools’ Head. The Head of the River Race is 2 weeks later on March 30th and the Vesta Veterans’ Head takes place on March 31st. Also on March 16th is the Ponteland Junior Head on the River Tyne. The first regatta of the new season In the Northern region takes place at Chester-le-Street on April 6th, and DARC’s Boat Race Ball takes place the same evening at 7pm. This entry was posted in Racing News, Uncategorized on March 10, 2019 by Colin Lawson. There’s been no time for resting on his laurels for DARC’s Roger Stainforth since celebrating a fifth success at the British Rowing Indoor Championships in December. Never one to forego a challenge Roger’s latest endeavour stemmed from a chance conversation at the Burns Night supper which led to him gathering together a team for the Big Pink Ergo 100km Challenge. “Here’s a question that might test even the teams in ‘Brain of Britain’. 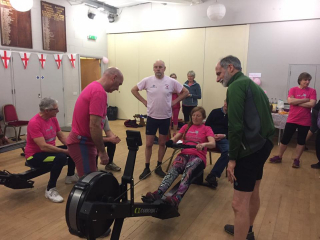 What connects Burns Night, 27 people aged 7 to 74, 100km on the ergo, breast cancer and Harry Potter? The answer begins at Durham ARC’s Burns Night supper. 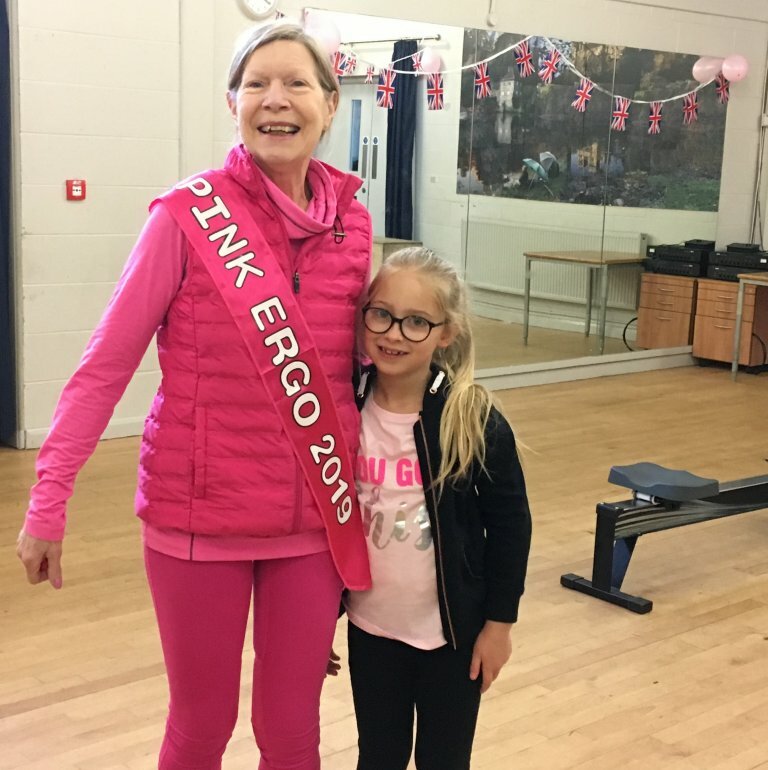 A day or two earlier a notice appeared on the club’s notice board announcing that a Durham University student, Alexandra Nicholas, was organising a BIG PINK ERGO 100km challenge for teams to raise money for breast cancer charities on 24 February 2019. The event was to be held at DARC where we have a fleet of new ergos and the club is always happy to be involved in this admirable enterprise. It was very poignant for me because my wife, Hazel, had surgery and radiotherapy treatment from September to December 2018 for breast cancer. After the haggis, neeps and tatties I started sounding out people about getting a DARC team together to enter and was pleasantly surprised by the positive responses. As it turned out 24 February was not a good day for many DARC people, Alexandra was happy we wanted to join in so we fixed on Sunday 3 March. 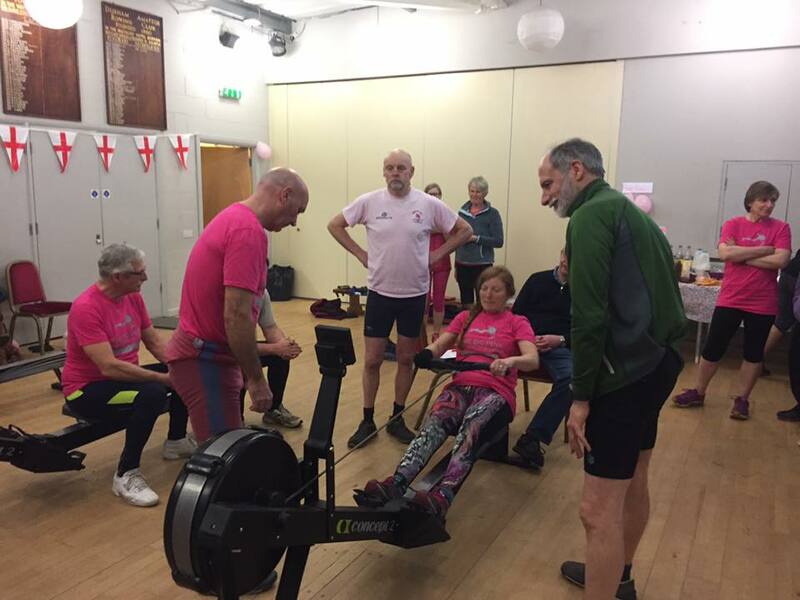 Having had experience of being a member of two 100km world record setting 70+ relay teams – small team 2016 and large team 2017 – I didn’t think the frenetic race format would work for a charity event, and in the end we decided on four squads of four ‘core’ rowers rowing 500m each in relays for two hours, and others joining in when convenient for them. It worked out really well, a total of 27 people participated; many stayed all day and did their bit in each of the four squads. Appropriately kitted out all in pink, Hazel set the event going at 0930 with the first 500m, did more 500m during the course of the day and took us through the final moments as the meter counted down to zero. What about the statistics of the day? 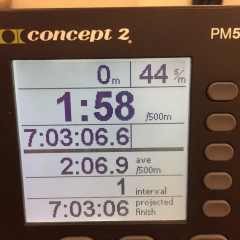 The 100km was achieved by 27 rowers in 7h 03m 6.6s at an average split of 2.06.9 and stroke rate of 26. 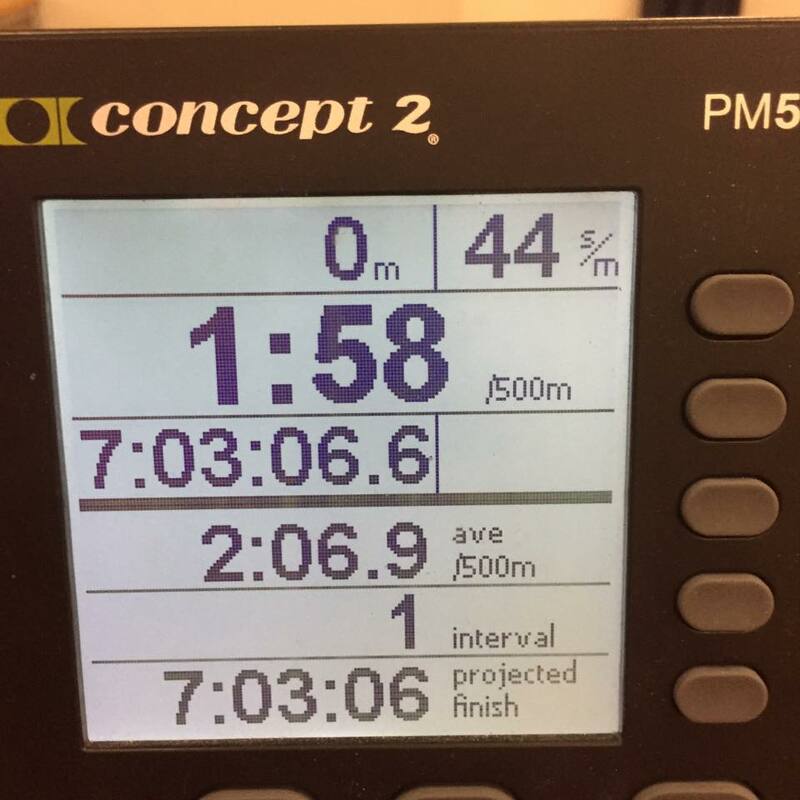 I’d thought 7½-8 hours would be achievable but what happens when you have competitive people taking turns on ergos? They compete! We all enjoyed the assertive 500m pieces by former GB rower Tom Edwards powering to split times of which the rest of us can only dream. There were some notable 500m by the women and as the metres ticked down so did the projected time. What about the final clue and Harry Potter? No, he wasn’t in the team but he was in the mind of our youngest and most determined rower, 7 years old Sophia, who asked me, the oldest in the team, ‘Do you know about Harry Potter?’ I had to confess that I didn’t know much. Thereafter, between my 500m pieces I was treated to picture cards and stories about Mr Potter. Perhaps British Rowing could introduce something similar at BRIC 2019! So far the money raised for breast cancer charities is £770 and there’s more to come. Roger’s first indoor rowing competition at the age of 60 was at the 2004 BIRC in Birmingham. When the event became BRIC in February 2015 and moved to the Lee Valley Velodrome he set the British record for 70+ Hwt of 7.08.7 and has won the gold medal in the four subsequent BRICs. This entry was posted in Club News on March 9, 2019 by Colin Lawson.